You all know by now how much I love me an Ackermann print...but there were periods during its long run that the fashion prints from La Belle Assemblée outshone even Mr. Ackermann’s wonderful fashion plates in terms of creativity of the depicted fashion and its presentation...and here’s a plate from one of those times. 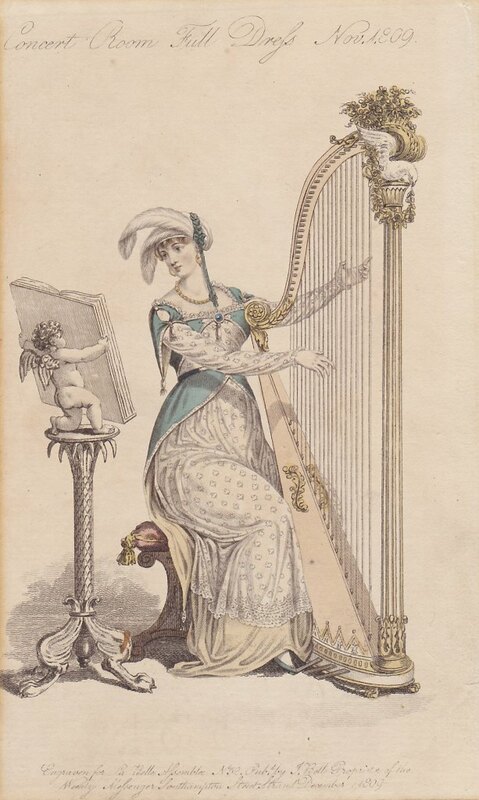 This is a Concert-Room Full Dress from the November 1809 issue (though the print is labeled December at the bottom.) 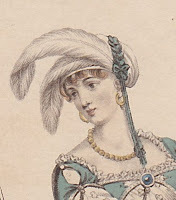 The accompanying text reads, A Polanese dress of green and yellow double twilled sarsnet,; worn over a drapery of rich white lace, with long sleeves; confined at the bosom, the waist, and on the arms by topaz brooches; ornamented with silver trimming and tassels; a body and train of yellow satin. 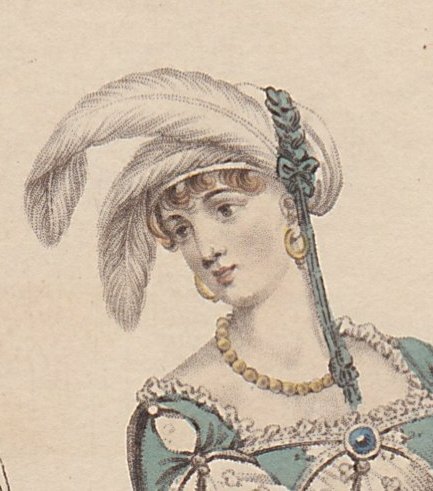 A Grecian head-dress, composed of silver spangled crape and white satin, marked off at the crown by a wreath of green foil, and finished on the left side with a silver cord and tassels, worn with two white ostrich feathers tipped with green. Topaz necklace and earrings. Shoes and gloves of pale yellow, white, or green. The hair in full short ringlet curls. So we have our accomplished young woman (obviously her mama made sure she was educated in all the genteel arts) wearing a yellow satin under-dress, with an over-dress of lace, over which is the unusual green “Polanese” (we’re more familiar with the term “polonaise”, which means a gown with cutaways to show an underskirt, after the fashion of Polish traditional dress) with the topaz brooches holding it in place and, of course, the tassels (there’s one visible down near her hem as well as at her arms). At least her arms seem mostly unencumbered—the close-fitting sleeves are most practical— though I think the feathers and long hanging tassel in the head-dress would get on my nerves were I trying to play an instrument. But I can’t deny that they lend a certain insouciance to the ensemble. And—oh my word—the furniture! I think the engraver must have had great fun designing that harp and the marvelous music stand, with its lions’ feet, palm-tree column, and chubby cherub at the top—a somewhat feverish mixture of styles, but it can’t be denied that it’s picturesque.